For nearly a month the U.S. 4th Armored Division had been fighting in difficult terrain to clear Lorraine. 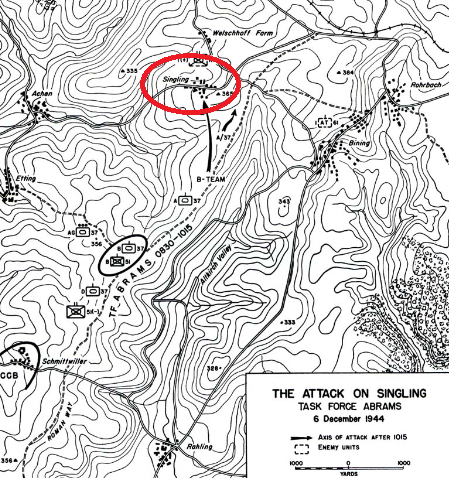 On December 6th in an attempt to take Bining and Rohrbach and reach the River Sarre and the German border, Lt. Colonel Creighton Abrams’ tank battalion was broken into two combat teams to facilitate its advance. Sweeping north, the lead task force came under heavy direct fire from the direction of Singling. Abrams decided on his own initiative to attack the town and attempt to hold it while the remainder of his force turned toward Bining. . .